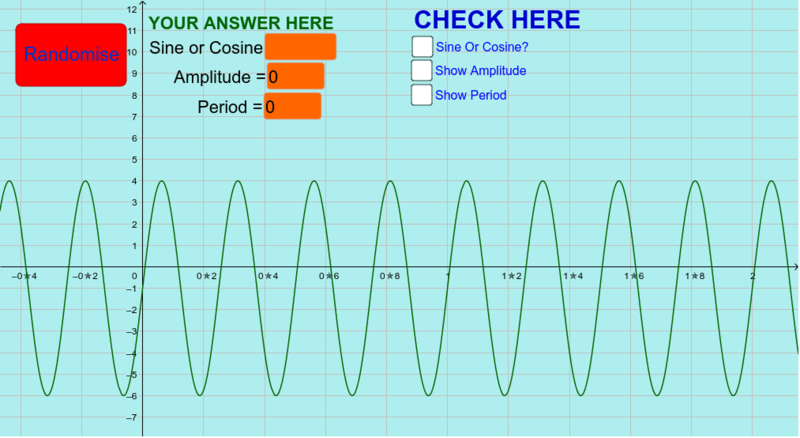 In this worksheet, you'll be looking at periodic functions, their amplitude and their period. Step 1. Press Randomise Step 2. Is the function a Sine or Cosine Function (assume no phase shift) Type in your answer. (use Capital letter for Sine and Cosine. Step 3. What is the amplitude of the function? Type in your answer. Step 4. What is the period of the function? Type in your answer. Step 5. You can double check your answers by checking the tickboxes. Repeat and repeat until you are 100% confident you can find the answers to all questions every time!